We believe Valdosta State University is a true learning community where professors and students learn from one another in a friendly and supportive academic environment. We recognize that it is simply not enough to relay information; our goal focuses on the long-term, total educational experience of each of our students. Our success is measured by your success. VSU is just the right size... enough to provide the personal attention you would expect of a selective private college, yet big enough to offer outstanding faculty, extensive academic programs and social opportunities of a major university. Our campus is noted for its natural beauty and award-winning design. 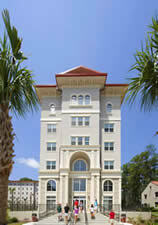 About our campus... pines, palms, dogwoods, camellias, lots of azaleas and vast green lawns-well, you get the picture. It's a beautiful campus. 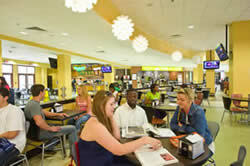 When you arrive here, you will feel good-the way you should feel about your university. 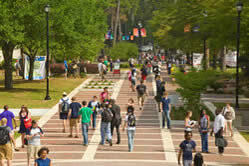 VSU is also ideally located-just look at a map. You'll see we are located just above the Florida line on I-75 within easy driving distance of the beaches, resorts and recreational areas of Georgia and Florida. The Valdosta community is as welcoming as you would expect southern hospitality to be. For more information regarding Valdosta as a community, please visit the official Greeting Service website. VSU's greatest strength is our faculty whose primary focus is on teaching. They care about their students and challenge them to achieve their full academic potential. Every course is taught by experienced professors with world-class credentials, not by graduate assistants. There are more than 450 men and women on our faculty and more than 78 percent of them hold a doctoral degree or the highest degree in their fields. They're not here by accident. They chose to teach at VSU because it's the kind of university where they can make a difference. VSU is not a small school. With over 12,500 students, we think we're just the right size. We are large enough to offer more than 90 degree programs of study, yet small enough to offer the individualized attention you deserve. The average undergraduate class size is 24, with a student faculty ratio of 21 to 1. This ratio allows meaningful interaction between faculty and students. We think that's important. The strength of our student body lies in its diversity. We currently have students from every county in Georgia, 47 states and 58 foreign countries. Our students are exactly like you, yet totally different from you. You'll be around people who make you feel right at home, but also challenge you with different perspectives on life. In addition to offering a broad range of academic majors, we offer the kind of curriculum that will prepare you for today's constantly changing work environment. We have programs that you would expect to find at almost any college, but we also have a number of programs found only at larger universities. You might consider studying astronomy; radio and television; sports medicine; communication disorders; nursing or music performance.